Jan Podgornik 2 weeks, 2 days síðan. 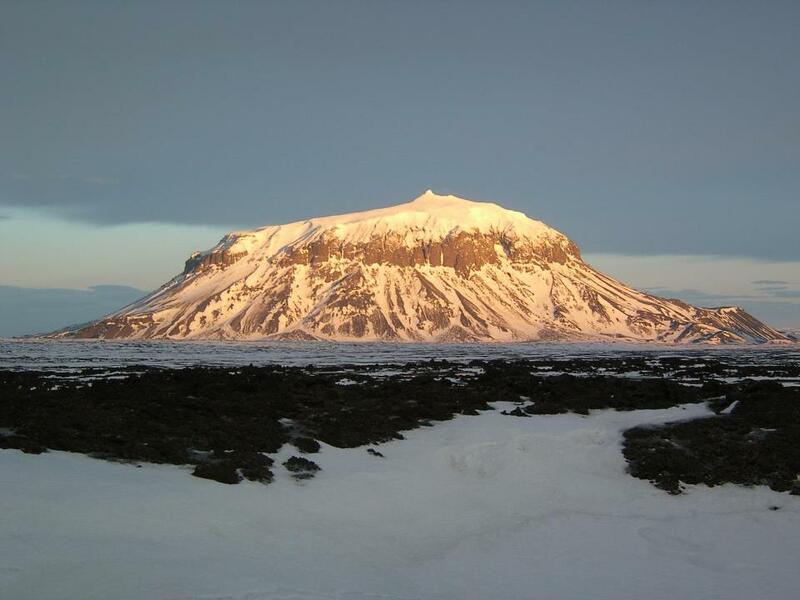 A group of Slovenian climbers are planing a visit to Iceland next spring. I am interested in existing routes on Herdubreid. Are there any beside normal route? I am interested in making some new ascents. You only find young volcanic rock in that region that is loose and unstable for climbing. During thawing season in spring, -late April to middle of June the driving trail from Road no 1 is closed. That means all driving is banned. In winter its allowed to drive in there but you need 4×4 capable of 2-4 PSI ground pressure. Herðubreið has been climbed in winter from north and scrambled from SE in summer. In late winter it is possible to find long interesting and unclimbed ice routes on the south side of Herðubreið. Finding that in climbing conditions is far from guarantied. In spring Herðubreið and Askja are better suited for skiing than climbing. This photo is from EaSTER and shows the normal route on Herðubreið, a ski slope that has been driven up and down on snowmobiles. Possible ice routes are further right but belted by the sun that late in winter. So we decided to focus on skiing Herdubreid. we will ski there with pulkas next week and try to ski some hard lines. is there any information on what routes have been done yet?